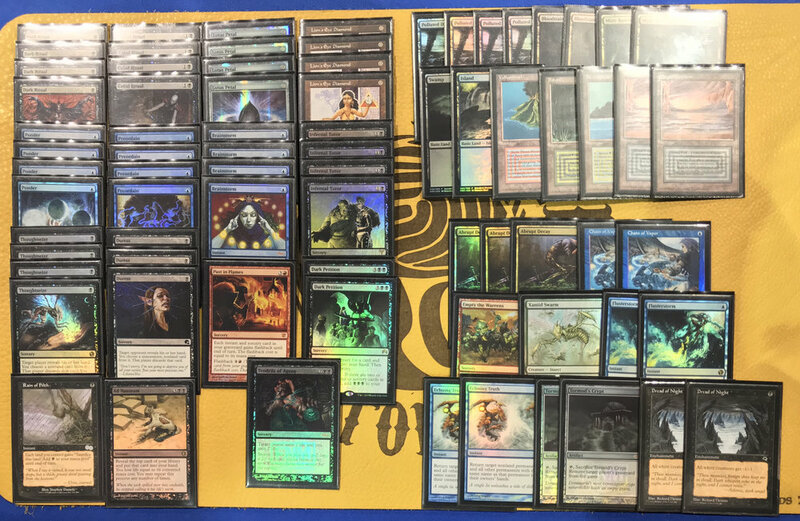 This past week I got to play an incredible amount of Legacy at GP Richmond. I got to meet up with some great friends I haven’t seen in a long time and meet with some amazing people for the first time. Overall, it was probably one of best experiences I’ve had at an event in a long time. My buddy Dana and I left Arizona on Wednesday so that we could have all day Thursday for spending time with friends, meeting artists, looking for deals from vendors, and participating in Last Chance Trials. During our layover in Dallas, we linked up with another friend, CJ, and we were on our way to Richmond! Two more friends, Tye and James, would join us the following day from North Carolina. I’d like to take a second to point out that being able to use an event like this to meet up with friends from all over the country that I haven’t seen in months, was by far the best part of the trip. Then I came across Cyrus’ stream, and he was crushing people with ANT. It was great because, for the most part, he was only streaming with variations of Storm. Whenever I was off work, I was either watching his stream or his VODs while taking care of my son. He even put together an amazing sideboard guide and I can’t thank him and the other players in the MTG - Ad Nauseam Tendrils Facebook Group and Storm Discord enough for their help. If I have a land to spare against a Wasteland deck, I’ll sometimes intentionally play a dual land into their Wasteland to get Threshold for my Cabal Rituals, especially if I’m fetching for it (I might even pretend it’s a mistake with an “Oh, I’m dumb” comment). I’ll be down a land but it nets me one mana. This mattered several times throughout the tournament against soft counter spells and taxing effects. My matchups against UB Shadow were frustrating because I've had a great record against it on MTGO but those were the rounds my deck chose to let me down and I mulled/drew poorly. During this tournament I focused very heavily on my mindset. I’m going to dive a little deeper into what I was doing because I feel that it helped me tremendously and I think it will benefit other players to understand these concepts. “Play Smarter” was always on my mind. It was a mantra on the forefront of my thoughts. I saw my opening seven and I made sure I thought about lines of play, even if it seemed like an auto-keep. I made sure I thought about my opponent’s outs before “just going for it.” I thought about how many more critical turns I had left before I was probably out of the game. I thought about what lands each fetch could get and which ones they couldn't get. While side-boarding, I asked myself, “what is my opponent trying to do in games two and three?” I thought about it all. "I will play my deck better than you will play yours"
Of course, I'm never going to say this to my opponent because then I’d just be a jerk, but there's nothing wrong with that confident mindset. I saw my opponents make mistakes all weekend with targeted discard or countering the wrong spell. I made sure I stayed level-headed and confident. I knew this was working when I was able to maintain that mindset against MTGO Miracles expert mzfroste, Daryl Ayers on Lands (despite the bad match-up he's still one of the best Lands players), and even when I had to play Cyrus. Some of the games it was enough, others it wasn't. Either way, the results weren't what mattered; I gave most of those games everything with nearly no mistakes. Coincidentally, this is a great way to not be a result-oriented thinker. "Limit discussions about matches/avoid bad beats stories"
Back in May, Julian Knab wrote an article and mentioned his tournament routine. He mentioned "don't watch your friend's play," "generally avoid people’s bad beat stories," and "avoid stress at all costs," among some other great guidelines. So, I tried my best to limit discussing my matches to 10-15 seconds and I actively avoided “bad beats” stories; I literally would walk away if someone started complaining about their match. I took the time in between rounds to reset. I didn't want to relive any of my matches, regret any decisions, or try to work through anybody else's games. What's interesting is, this reminded me of playing football and baseball. After every inning or change of possession, it was a good idea to reset or adjust; you didn't want to linger on what happened during the last play. There were at least five more ANT players that placed higher than me. The deck is far from dead and I highly recommend it to anyone that is looking for a deck that rewards you for the time that you put into it. It's extremely difficult for your opponent to decipher how you're trying to combo off especially if you've set things up with cantrips for the following turn(s). The MTG - Ad Nauseam Tendrils Facebook Group and Discord are great resources for those that are looking for a place to start. It was great meeting fellow storm players Cyrus, Brandon, Cliffy, Stefan, and a few others (long days; I tried to remember everyone's name). I was literally one win away from being on the same (standings) page as them. It was great finally meeting Jerry Mee, host of Leaving a Legacy. After I received so many compliments all weekend on the leather Leaving a Legacy playmat I have, I realized I never showed it to him. I'll bring it next time. I enjoyed discussing games and strategy with James Hsu, host of Humans of Magic. After listening to his amazing podcast, I wanted to discuss questioning and interviewing techniques with him and totally forgot. I'll have to save that for next time, as well. I finally got to meet Romario. I've been watching him stream legacy for well over a year and I was too busy at previous GPs/Opens/Eternal Weekends to find him. During this GP, I got to talk to him several times and it was great. I'm looking forward to watching his stream all the way up to the next Legacy event I go to. Last thing I want to mention... it was great having several players talk to me about my streaming. There were (seemingly) random players that wanted to know how well I was doing in the event like they had a vested interest in my success. That's something I'm going to have to get used to but, in the meantime, they have definitely motivated me to create more content and do better at the game. Tye is playing UB Shadow during a side event. During side-boarding, James notices Tye has a Pyroblast in his sideboard. James watches the whole game and ask Tye afterward if he even has a way to generate the red mana to cast the Pyroblast... he doesn't.